Well my dear friends and readers, how every many there are out there, this will be our LAST Sister's Challenge. Not because we don't like doing it, but because I have made the hard decision to no longer co-author Occasionally Crafty with my sister. I think there are moments in life where you find yourself evaluating how you are spending the precious moments you have. I personally have so many things that I love doing, and crafting is way up there. But ever since we left Korea I've been dreaming of a way to be more effective as a piano teacher. See, in Korea they do all their core subjects in the morning and then the students split into various Hagwons, or schools for specific extra subjects. The kids who want to learn piano go every day to their piano hagwon and practice for 45 minutes and get a 15 minute lesson. It's brilliant, but not quite feasible without renting out a studio space. Well I figured out a way to make something similar happen out of my home, and after a lot of prayer, trial lessons, time and effort, I have discovered a new way of teaching the both scares and exhilarates me! But I quickly noticed how much time and preparation was necessary to make this work, especially when I open this up to all of my students. Something had to go, and for me it was the blog. So thank you for all your comments and support throughout the years. I have some fun facts about my time on Occasionally Crafty, and then be sure to keep on reading for my Rainbow project! Post with the most hits- Melted Snowman Ornament 62,651!! I also want to take a moment to thank Valerie. This blog is her baby, and she welcomed me in! It has been an awesome way to do something together even though we're often far apart. We haven't always agreed on everything, but I think working together on the blog has strengthened our relationship and it will be something we'll always remember. Love you Valerie! So PLEASE, keep coming back and seeing the amazing things Valerie has planned for the blog. Her enthusiasm has never been higher and she's got a lot of great ideas just waiting to be shared. I'll be her #1 fan and you all just be right there with me! Enough babbling from me- you're here to see what I made! Valerie picked the theme of Rainbow for our last Sister's challenge. I wanted to knit something for you, and when I saw this yarn, I knew it was perfect for a spring scarf! 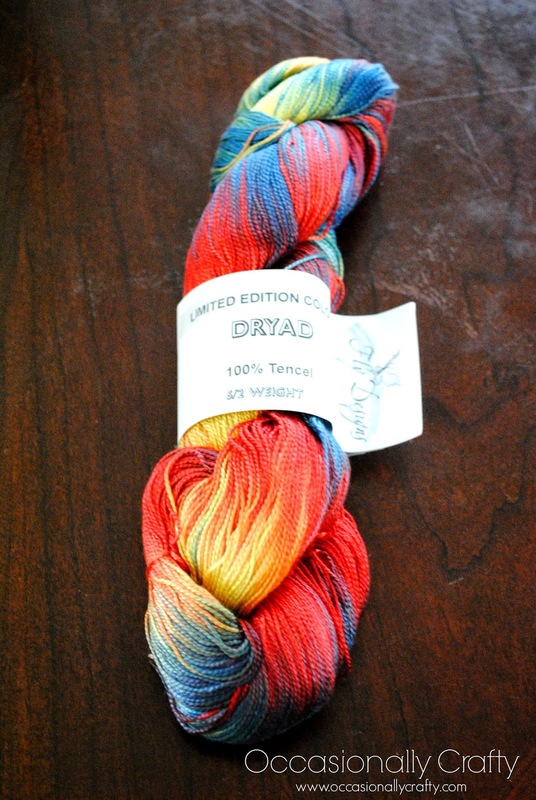 Isn't this the prettiest yarn you've ever seen? Hand dyed, lace weight yarn from Angora Valley on Etsy. I found this simple pattern here, and I just love how it turned out. It's a nice, lightweight scarf that is bright and beautiful for Spring! Bye!! I'll miss sharing this part of my life with you, but don't worry, I'll still be Occasionally Crafty! It's always such a hard decision to step back from a blog, but I admire your bravery in pursuing another passion and knowing your limits! 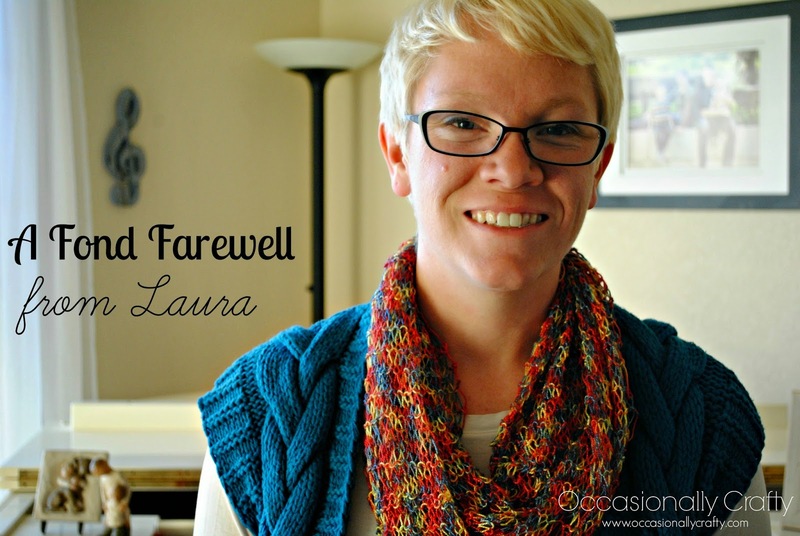 Good luck in all of your endeavors, Laura! Thanks so much Kalyn! I've enjoyed getting to know so many great bloggers like you and I'll still be following along :) Good luck to you as well! I'm a new reader here. That scarf is absolutely beautiful! Good luck on your new endeavors teaching piano - It sounds like such a wonderful, though probably time consuming project. Worth every minute of it for your students though. Thanks for the support Shannon! It's been great getting to know you all too, and I wish you the best! Thanks Chrisy, I'm very excited! 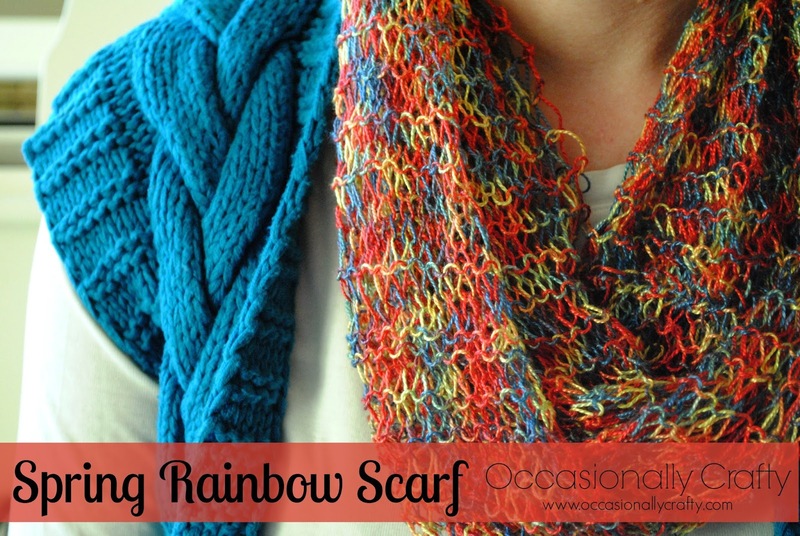 I love bright colors for spring, and this scarf looks perfect! Good luck with your piano lessons! Sometimes the biggest risk is stepping away from what is familiar to pursue something new but, in the end so rewarding. Best of luck. That's pretty much what I'm feeling! Thanks for your support Coralie! Tough decision - but exciting things ahead for you! Aww, thanks for your well wishes and compliments on the scarf! Success comes with hard decisions. Good luck with your new endeavors. What a beautiful scarf you made, Laura! Best of luck with this new chapter. If you ever miss blogging, I'm sure Valerie will be happy to let you guest post ;). I'm glad you like the scarf. Thanks for the encouragement! My mother-in-law has been trying to teach me to sew and knot for some time now. I'm not bad at it but at some point I become disinterested and I mess up along the way. I am currently attempting my fourth scarf. I'm sure i'll get it one day! I love that you keep trying! I did a whole bunch of dishcloths before trying much else! Thanks Jessica! Best of luck to you too, thanks for all the organization tips!